What do popular television makeover programs like What Not to Wear, The Biggest Loser, Queer Eye for the Straight Guy, and The Swan tell us about how to look and feel? What do they tell us about what a good life looks like in contemporary America? This new film based on Katherine Sender's book The Makeover explores these questions against the backdrop of American ideals of self-invention and upward mobility. Asking what it means to be an authentic self in an increasingly mediated world -- to be both ordinary and special, to be happy with who we are while always wanting something better -- Brand New You shows how the interventions featured in makeover shows, from weight loss to cosmetic surgery, reproduce conventional norms of physical attractiveness and success. Taking a wider social and cultural view, it also shows how these programs have become models of self-transformation at precisely the same time jobs have become harder to find and keep, and women and men have been forced to remake themselves to compete in a rapidly changing labor marketplace. Intended for courses in communication, gender studies, critical race theory, history, and sociology. Featuring interviews with Dana Heller, Misha Kavka, Susan Murray, Kathy Peiss, Katherine Sender & Brenda Weber. "One of MEF's best, this is a wonderfully expansive video, about media and identity, beauty, class, race, happiness, gender, representation, sexuality, and more. Full of thoughtful analysis, historical context, and critique." "Brand New You gives makeover shows their very own makeover. Filled with brilliant commentary and lively footage, it explains the origins and workings of 'reality' media across history." "Brand New You is a brilliant film that is a must-see for students who want a comprehensive historical and cultural understanding of reality makeover television. Katherine Sender provides a critical analysis of how the 'authentic self' is created through the guise of hair, clothing and sometimes surgical enhancements. A must-have for classroom discussions!" "Brand New You, directed by media scholar Katherine Sender, takes a critical scalpel to the face of primetime entertainment TV. Leading us on a journey through the trashy but fascinating world of makeover shows and reality confessionals, this entertaining documentary explores the popular appeal and the ideological workings underpinning the transformational claims of consumer capitalism." "Katherine Sender's Brand New You: Makeover Television and the American Dream cuts into the core of what makes this sub-genre of reality television so compelling and so disturbing. The documentary cannily examines the social, industrial, and cultural motivations and implications for series like The Biggest Loser and What Not to Wear following well-honed methods of critical analysis. Viewers will come away from this film understanding how the sub-genre appeals to its audience and what that appeal says about American values of the self." "A compelling look at the makeover industry, which sells the concept that there can be a 'brand new you' if you're lucky enough to win a slot on one of the makeover shows -- a privilege reserved only for the few. Issues of class, race and gender are clearly addressed in this concise, expertly edited documentary -- a real contribution to the field of body studies in the 21st century." "Brand New You unpacks the complexities of makeover television within American mythologies of individualism, consumerism and the quest for upward mobility. Resisting easy dismissals of makeover television as superficial, this deeply researched film situates makeover television as a central cultural space for constituting and renegotiating understandings of the American Dream. The film convincingly shows how makeover television has redefined the American Dream as requiring us to identify and project ourselves as 'authentic' singularities where experts coach us to shed our multiple selves to aspire for idealized upwardly mobile bodies, attire, demeanors and lifestyles. Brand New You reveals the forms of class, gender and race privilege that inform these ideals for television makeovers even as viewers critically reflect upon, and even reject, these standards of self-transformation." 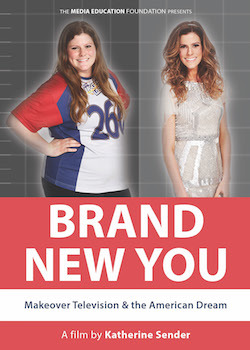 "Brand New You is a fantastic educational resource that reveals how makeovers represent what's apparently wrong with people's lives and then provide solutions that promise personal improvement. In doing so it raises a range of important critical questions about gender, identities, and updated versions of the American Dream that depict consumerism as the route to the good life." "Katherine Sender's Brand New You makes deft use of contemporary and historical television footage along with expert interviews to tell the fascinating story of how image and consumerism have been central to the so-called American Dream. While weaving in the crucial issues of race, gender, sexuality, and class, Sender helpfully unpacks how surveillance, self-reflexivity, and emotional labor operate in the makeover genre and indeed in contemporary American life itself. The film also touches on the reception of makeover television by audiences in the United States and across the globe. Brand New You is essential viewing for teachers and students of media and consumer culture." "From Queen for a Day to The Swan, Brand New You offers a series of compelling insights into makeover TV. The genre is situated within both a history of televisual and other media precursors and within the cultural contexts of a shifting but enduringly beguiling notion of 'The American Dream', predicated from its inception on the aspirational potential to achieve 'transformation'. Makeover TV's endorsement of and investment in troubling ideologies of consumerism, heteronormative femininity and 'ethnic anonymity' where white subjects predominate are all illuminated, while the film points also to how audiences simultaneously critique and embrace different aspects of these series. Through all this, a succession of striking extracts unfold against the critical commentary, neatly elucidating how the promise and the difficulty of attaining greater self-realisation, and personal and physical reinvention -- captured in the moment of 'the reveal' -- can make for such absorbing and problematic programming." "Lively, engaging and thoroughly critical -- a perfect storm to hold makeover shows to critical account. There'll be no passive viewing of makeover TV shows after watching Brand New You!" "Brand New You is a smart, reflective, entertaining look at a genre of television new to the 21st century -- makeover reality television. It calls on the viewer to question the value of physical self-transformation in a consumer-driven culture and consider the deeper psychological meaning of our appearance and our desire for self improvement."